This newly released Cassini image was taken during the flyby of Dione this past summer. Saturn’s rings are so expansive that they often sneak into Cassini’s pictures of other bodies. Here, they appear with the planet in a picture taken during a close flyby of Dione. The flyby of Dione (698 miles or 1123 kilometers across) during which this image was taken was the last close encounter with this moon during Cassini’s mission. The main goal of the flyby was to use the spacecraft as a probe to measure Dione’s gravity field. However, scientists also managed to take some very close images of the surface. All of the data will be helpful to understand the interior structure and geological history of this distant, icy world. This view is centered on terrain at 7 degrees south latitude, 122 degrees west longitude. The image was taken in visible light with the Cassini spacecraft narrow-angle camera on August 17, 2015. The view was obtained at a distance of approximately 48,000 miles (77,000 kilometers) from Dione and at a Sun-Dione-spacecraft, or phase angle of 35 degrees. Image scale is 1,520 feet (464 meters) per pixel. 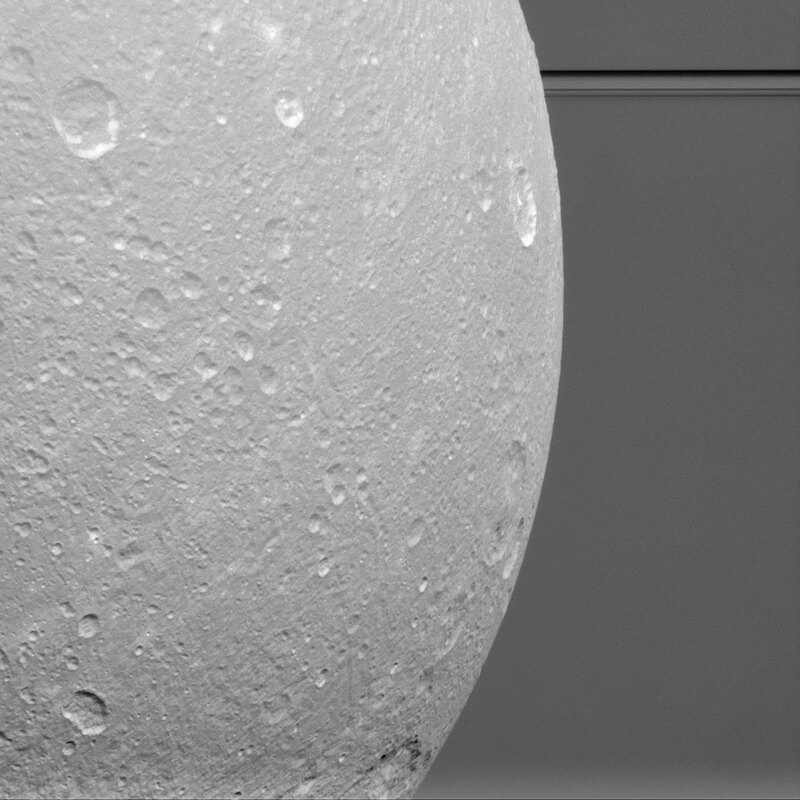 Be the first to comment on "New Cassini Image – Dione Before the Rings"